Pets love social interaction. At the end of a rough day, you can count on your pet to improve your mood the instant you walk through the door. Pets have been found to improve moods of those with depression. Controlling blood pressure is a problem pets can take care of too! Studies have found that pets are more effective than ACE inhibiting drugs at reducing stress and tension. Having someone listen to your problems can be a great way to release stress. Having your pet listen to your problems is the ultimate method of unconditional love. Besides having a furry friend, dogs and cats enjoy comfortable silence, keep secrets and are great snugglers. There's no wonder why pets have served in hospitals and nursing homes, providing support to those feeling socially isolated or lonely. 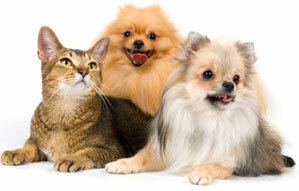 Pets can decrease your blood pressure Cholesterol levels Triglyceride levels Feelings of loneliness. Owning a pet can help to relieve stress. It's also important to watch the stress level of your pets as well. 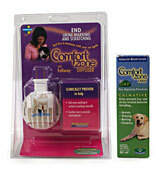 For dogs or cats that tend to stress out easily and need extra attention, Comfort Zone with D.A.P works well. Comfort Zone helps to comfort dogs who are stressed and are put in stressful situations such as: being left alone, having visitors around, traveling, moving to a new home, thunderstorms and loud noises, being around new/unfamiliar people, or during training. Comfort Zone releases dog-appeasing pheromones to calm your pet down. Comfort Zone with Feliway is also available for cats suffering from traveling, moving to a new house or being around visitors, new pets or family members. It works in the same manner as it helps alleviate stress and unwanted urinating by mimicking facial pheromone secreted by cats. It's always fun to take your pet out for exercising but why not go for an extra evening walk or go to the park to play with your pet's favorite toy. Exercising with your pet increases your opportunities for exercise and outdoor activities for socialization. The percentage of overweight pets ranges around 24-40%.